The return of a sold-out stunner! In tribute to one of our most popular masculine scents, we’ve decided to let the girls also have a chance…to be so very Bad! 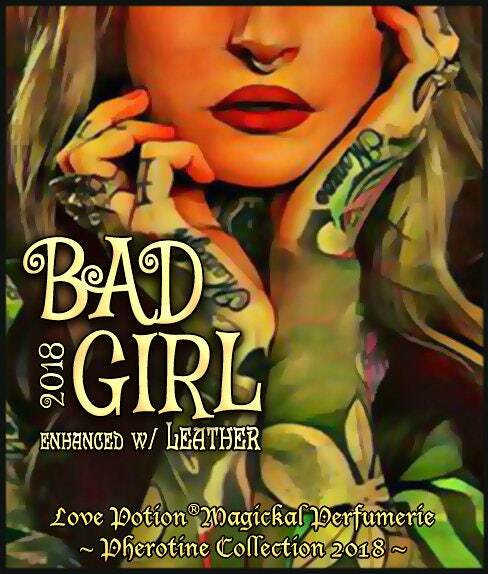 This is a thrillingly wicked and wild fragrance for your inner wanton woman, a salacious blend of “dirty” honeys and boozy vanilla extract get crazy with vanilla and vanilla bean, sweet sandalwood, suede leather, vanilla-flavored tobacco and a spicy dash of black pepper. And what more perfect pheromone pairing for this than our LEATHER pheromone formula – a variation on our Dominance Pheromone Blend for Women, made “softer” with the addition of the precious “ultra-feminizing” pheromone, Estratetraenol. Still clearly “alpha” in signature, but they'll be no mistaking you're all girl underneath the dominant exterior. Get your motor running, you’re a Bad Girl and you know it! Scent: Boozy vanilla extract infused with leather, honey, tobacco and a hint of spice. A partner in crime to our Bad Boy fragrance. NOTE: We have a limited number of VIRGIN bottles available, (No Pheromones!). Please make your choice carefully! Thank you. LEATHER ~ The musky scent of leather inspires feelings of lust, personal power, and provides a hint of danger. PEPPER ~ Protection, fidelity, dispels envy and evil, exorcism, breaks hexes.